So I don’t make pancake batter in the blender very often. 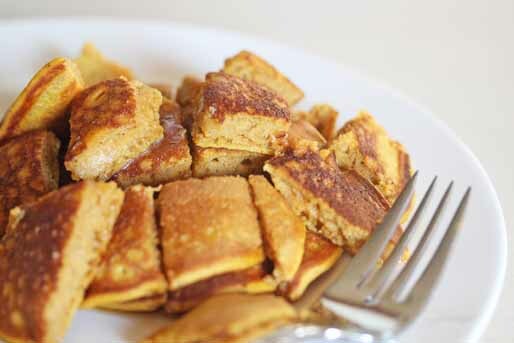 But we love Pumpkin Pancakes, but we don’t love that sometimes they turn out on the dense side. It’s hard to prevent that because pumpkin is really heavy and when you mix it into the batter, it makes the batter heavy. 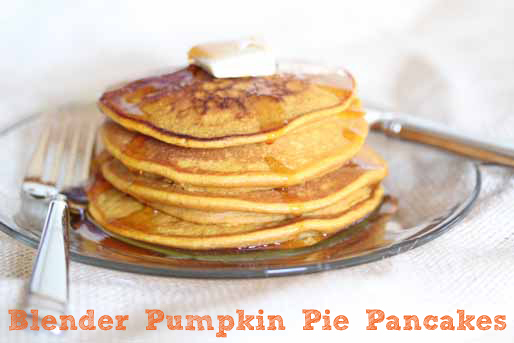 But I was making a smoothie the other day and wondered if making the pumpkin pancake batter in the blender would aerate it some, so that the pancakes would turn out fluffier. Hmm. I’ll let you decide for yourself, based on the photo below. See how fluffy these turned out…I thought they were fluff-ilicious! P.S. I usually double this recipe to use an entire 15 oz. can of pure pumpkin. Let them cool completely and then add to the freezer! Add both of the flours, baking powder, brown sugar and homemade pumpkin pie spice to theblender and pulse it a few times to mix the dry ingredients together. Pour into a bowl. 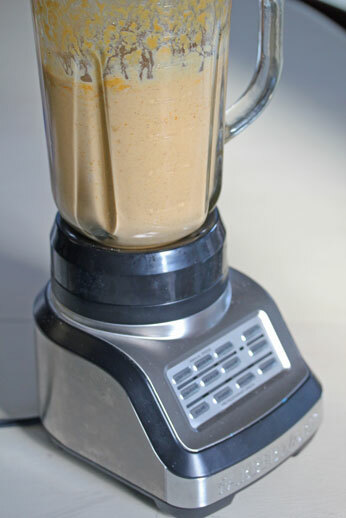 Add the milk, eggs, oil and pumpkin puree to the blender and pulse until smooth. Add half of the dry ingredients and blend. Then add the remaining dry ingredients and blend until smooth. Pour batter onto hot griddle to make pancakes. I usually use my blender for smoothies and milkshakes. I don’t own a blender but I would love to be able to make smoothies. I tweeted about the giveaway-https://twitter.com/mary1day/status/266903755587469312. I follow 5$ Dinners on Pinterest . I’m a Facebook follower and receive the email newsletter. I can’t find my blender right now but when I had it I used it to make smoothies. I use my blender for smoothies mainly! I love making milkshakes in the blender. My blender broke a few months ago and I need a new one! I love making strawberry banana OJ smoothies in the morning! I love to use a blender to mix up quick salad dressings. I use the blender to make baby food! I’d love to use the blender to make smoothies! I use my blender for all kinds of things, smoothies, home made spaghetti sauce, pesto and on and on! I love making icy coffee drinks in my blender!